What's the best way to clean very dirty tile grout? Straight Clorox is often too harsh, but other things are too weak. Anybody have a miracle solution? The trick for how to clean grout is to clean it regularly. Grout is rough, porous, and a magnet for dirt, grime, and soap scum. What Cleaners Can Be Used To Clean Grout? Normally, you can clean your grout with the same thing you are cleaning your tiles with, at the same time. For both tiles and grout it is important not to use an abrasive cleaner, at least for regular use, because these will scratch the surface of both the tile and grout. You can use a disinfectant cleaner, which contains bleach, to clean both ceramic tile and grout. What if you have very dirty grout, as the person asking the question above does? I agree, an application of undiluted bleach, as she mentions above, would be too harsh. That is because bleach is very strong, and almost always needs to be diluted for use in your home. However, I believe a solution of bleach and water, with a ratio of 3/4 cup of chlorine bleach to 1 gallon warm water, would be a good solution for cleaning dirty grout. a while, keeping it moist, to allow it to do its work. If you let it dry out it will not be as effective. Caution: bleach solution may fade colored grouts, so beware. Of course, if you have colored grout it is more likely to hide stains and dirt in the first place. 1. Spray on the cleaning compound and let it sit for a while to do its work (thus, not requiring you to scrub as much). 2. Use a toothbrush or a long-bristled vegetable brush (something relatively soft) to lightly scrub the grout. 3. Rinse by wiping the grout off with a clean wet sponge or cloth. The trick with grout is to find something that will clean it without requiring you to rub too hard. 1. You just don't want to rub too hard because that is too much work for grout. 2. 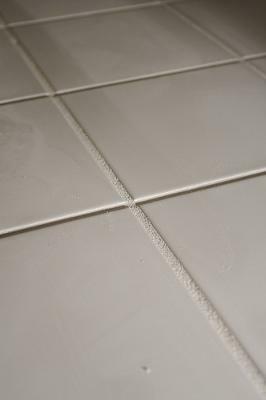 Rubbing too much, or with something too harsh can wear down the grout over time. 3. If you scrub too much it is likely to push the dirt further down in the pores of the grout instead of removing it. Does anyone else have any tips for how to clean grout? Please share them in the comments section below. I like to make a paste of water and baking soda and use this to clean my grout. I use an old toothbrush to scrub in this homemade grout cleaning paste, and it works really well for me.